Finds: Three anti-virus engines working together to find the widest range of infections. Removes: ‘Computer on a stick’ architecture provides a separate and clean operating system to fix Windows operating systems. Remote Access: Remote access independent of the host operating system, i.e. out-of-band remote management, like a remote access card for PCs. 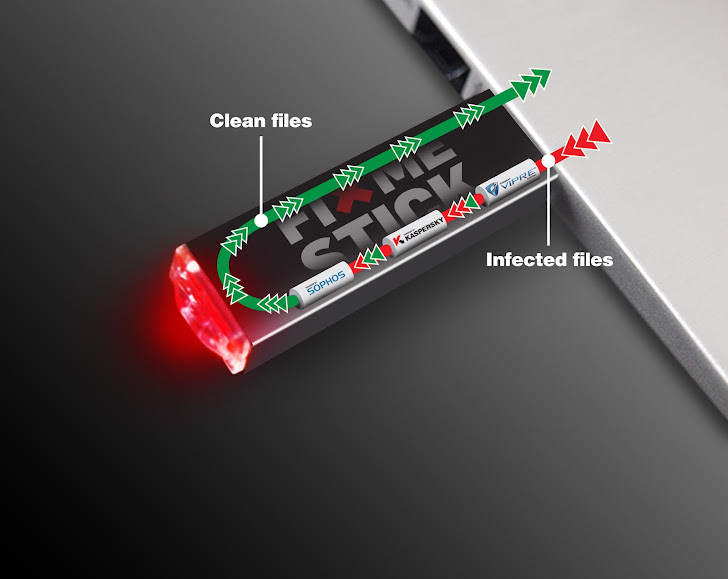 The FixMeStick® is a Linux-based device that runs before Windows boots enabling it to remove infections without the infection being able to block it. Contains a built-in multi-scanner composed of three anti-virus engines: Kaspersky Lab®, Sophos®, and GFI’s VIPRE®. The technology is integrated behind a single full-screen application (the user can use CTRL-T to launch a terminal). Any user can start with 2 steps: 1- insert key, and 2- double-click "Run FixMeStick". Easy to support: Any removal operation is 100% reversible with the click of a button. Systems supported: Any PC; A minimum of 512 MB of RAM. Bootability: The FixMeStick uses a bootloader menu system to provide multiple boot configuration options, one of which will work on essentially any PC (as of December 2012). Detection, Cleaning, Quarantine: Three anti-virus scanners provide the super-set of all three scanners’s detections. Each scanner is loaded into RAM, and files are fetched from disk once and passed to each scanner in parallel. The result is a scan time on par with desktop “on-demand” full system scans. Only if each of the scanners fail to clean an infected file is that file quarantined. Connectivity: The FixMeStick automatically seeks an Internet connection when it starts. It has built-in Ethernet drivers that support essentially all PC Ethernet hardware. It also contains built-in WiFi drivers that support most PC WiFi hardware. If the FixMeStick is booted from Windows (versus directly from the BIOS) the FixMeStick will automatically use the default WiFi SSID and password active on the Windows operating system (except on Vista). If an auto-connection is not possible the user can select their network from the WiFi picker that is displayed within FixMeStick. Once a connection is established, the FixMeStick downloads program and malware definition updates and stores them on the FixMeStick. The FixMeStick will work without a network connection, but it won’t be able to fetch the latest malware definition updates. Authentication: Each FixMeStick has a unique serial number in its firmware. This serial number identifies the FixMeStick to the FixMeStick Management Server. 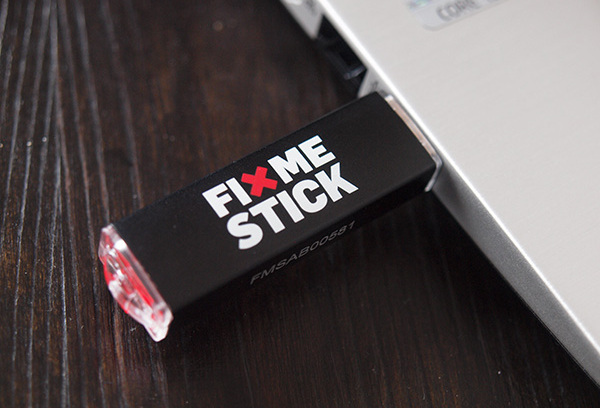 Each FixMeStick also has a tag etched into its outside. This unique tag maps to the unique serial number in the FixMeStick Management Server. Users identify their specific FixMeStick unit to their solution provider (or FixMeStick technical support) by providing this tag. Each FixMeStick also contains a TeamViewer® client. The FixMeStick user enters the key-combination “CTRL-ALT-R” and the TeamViewer client will display. The user provides the endpoint id and passcode to the solution provider, and the solution provider can remotely login to the FixMeStick, i.e. login to the Ubuntu-based operating system that is FixMeStick, from which they can manage the local device. If you want to check it out you can go to their website, and contact them directly with any technical questions you may have. Don't forget to use the coupon THNFIX to get the 30% discount on the Pro if you're interested in buying.